In the past I had mainly focused my attention on Authorization Servers weakness. As the cited Facebook's vulnerable regex pattern matching for redirect_uri. 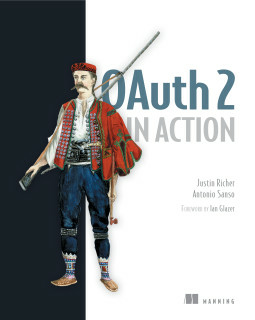 It turns out that also OAuth client can screw things up and leak token (or authorization codes). The main reason behind this is that sometimes Authorization Server (AS) use exotic and unexpected redirect_uri validation policies. As mentioned in some previous post the ONLY safe validation method the Authorization Server should adopt is exact matching (all the other potential solutions, based on partial matching i.e. pattern matching based on regex or allowing subdirectory of the registered redirect_uri, are suboptimal and sometimes even dangerous). According to the request above Google should have been registered the https://plus.google.com/c/auth as redirect_uri (since the redirect_uri request parameter above is of this form). As matter of fact they did register https://plus.google.com instead!! 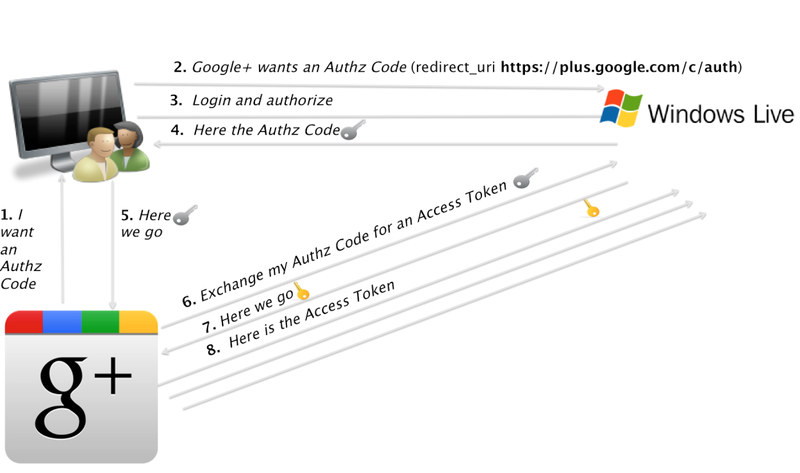 Now, Microsoft (https://login.live.com/oauth20_authorize.srf in this case) adopts the allowing subdirectory validation strategy (same as Github) for redirect_uri (namely validates only the start of the URI and considers valid redirect_uri if everything else is appended after the registered redirect_uri). This public post contains a link to the attacker web page (in the example https://asanso.github.io). https://login.live.com/oauth20_authorize.srf?response_type=code&client_id=000000004404170C&scope=wl.emails,wl.basic,wl.contacts_emails,wl.offline_access&redirect_uri=https://plus.google.com/app/basic/stream/z12wz30w5xekhjow504ch3vq4wi1gjzrd3w and make the victim click on it. To be noted that the crafted URI contains a redirect_uri that is equal to the malicious post (https://plus.google.com/app/basic/stream/z12wz30w5xekhjow504ch3vq4wi1gjzrd3w). 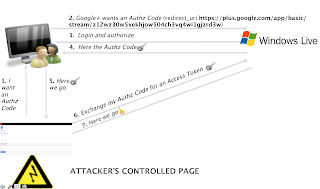 Since Google registered https://plus.google.com as redirect_uri and due the fact login.live.com adopts an allowing subdirectory validation strategy, https://plus.google.com/app/basic/stream/z12wz30w5xekhjow504ch3vq4wi1gjzrd3w is a perfectly valid redirect_uri. What’s now then? Note the code request parameter ends up being attached in the URI of the malicious post. Having the victim clicking to the link in the malicious post will make him end up to https://asanso.github.io. At this point the referrer will leak the authorization code. 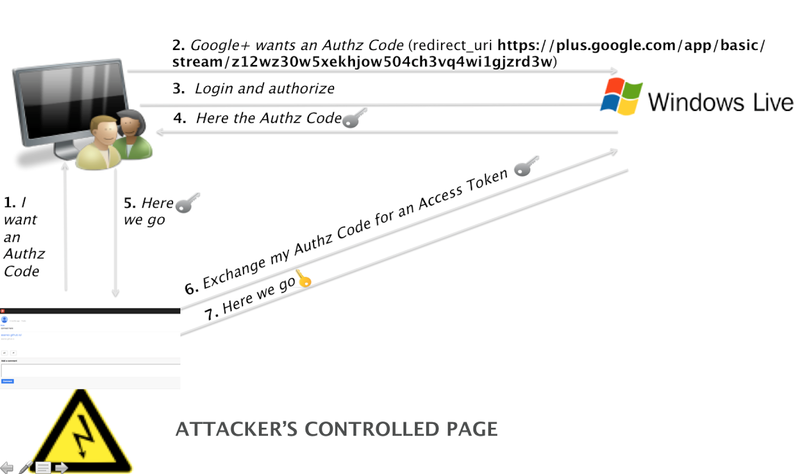 The attacker can just grab the authorization code from the Referer header. I did report this vulnerability to Google through the Google Vulnerability Reward Program (VRP) and they immediately acknowledged the problem (and Yep got a bounty for it :):)). Do the peculiar nature of the issue (also being an integration) it took a while to be fixed (but now it is). The fix is of course easy and as stated above is enough to register a more specific redirect_uri (aka https://plus.google.com/c/auth in this case). Well this is the end of part #1. I will have yet more to come on the same subject but can't disclosed right now since vendors are still on the verge of fixing those issues... hence as always DO stay tuned and if you are interested on this topic I am @asanso on twitter. P.S. there is a similar issue discovered by Andris Atteka (now fixed). In his blog post he was wondering if this was a Relying Party (Google) or Authentication Provider (Microsoft) problem. I hope this blog post clarified that this was a Relying Party (small) mistake that can have unwanted side effect though.